Celebrated architect, musician, engineer, scientist and inventor Leonardo da Vinci said, “Once you have tasted flight, you will forever walk the earth with your eyes turned skyward, for there you have been, and there you will always long to return.” He would know considering he sketched the first parachute, first helicopter, first aeroplane, first tank, first repeating rifle, swinging bridge, paddle boat and first motor car. 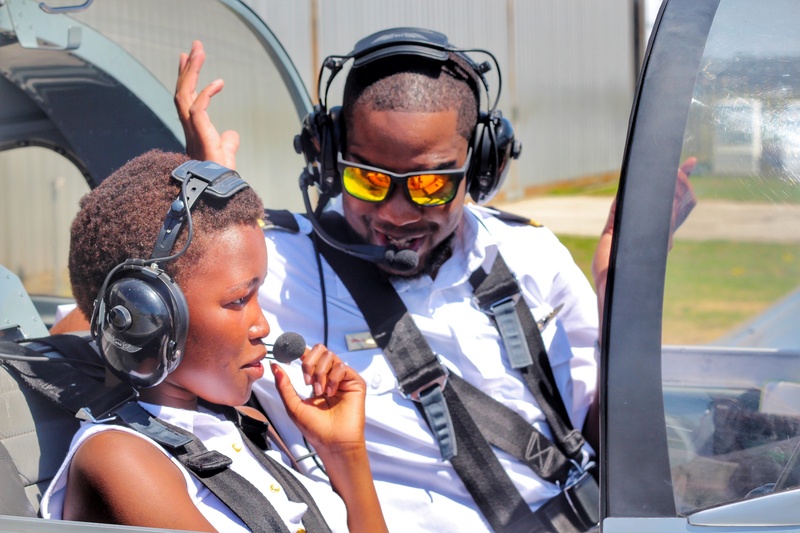 Fourteen-year-old Sibongile Ndara knows this to be true, following his own personal experience in a Sling 2 – a South African two-seater light aircraft.“During take-off I was terrified. I have never been in the air so it was really scary. 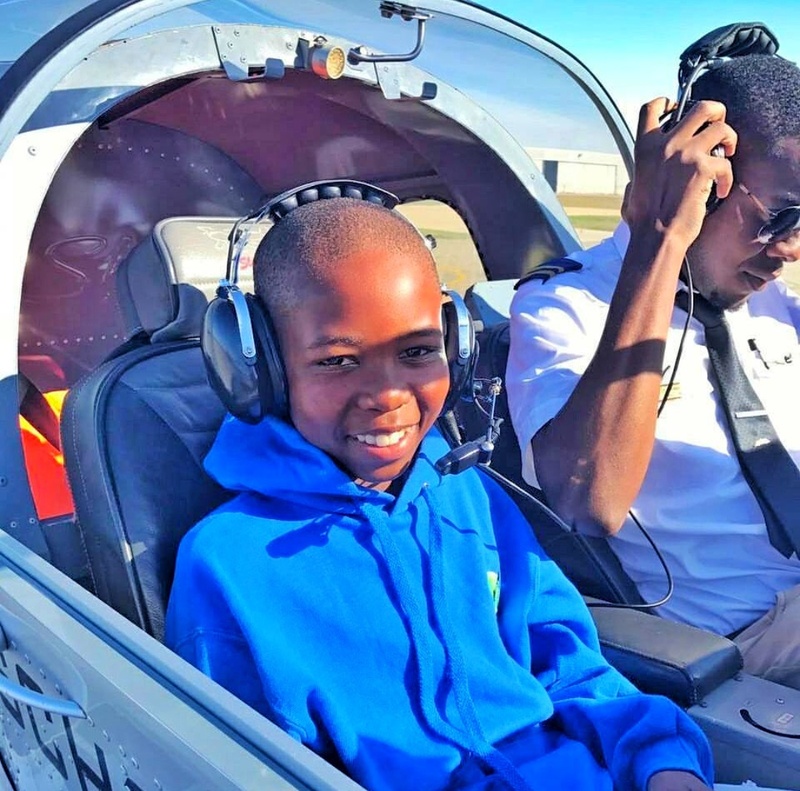 But this was the best day of my life and now I know that I definitely want to be a pilot when I grow up.” Sibongile revealed this in an interview with the Port Elizabeth Herald right after his flight facilitated by Dream Alive Foundation, a brain child of a 27-year-old Zimbabwean pilot, Tatenda Chigwada. For a few moments while flying Sibongile was able to temporarily forget that he almost missed this opportunity because the small one-bedroom shack in Walmer Township where he lived at the time with his mother and sister had been flooded following days of heavy downpour. Now Sibongile, through a scholarship facilitated by Dream Alive Foundation, is now studying towards becoming a pilot at a prestigious private school where he began his studies at the beginning of this calendar year. His scholarship has been made possible by both the Helicopter Company as well as the Madiba Bay School in Port Elizabeth, South Africa. Among the other children who flew with other pilots; one said he would one day take up the pilot who had taken him on the scenic flight. Another, a young Xhosa girl was so inspired by her flight thatshe has started learning the phonetic alphabet to realise her dream to become a pilot. 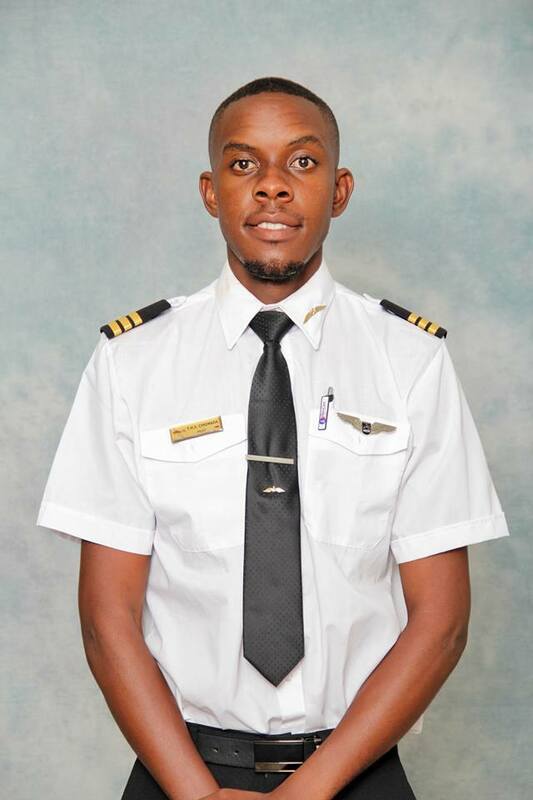 Chigwada obtained his commercial pilot’s license in November 2017 at Madiba Bay School of Flight in Port Elizabeth, South Africa and is the Founder and Director the Dream Alive Foundation. Pilot Tatenda Chigwada. Photo Courtesy. What is the Dream Alive Foundation and where did the idea to found it come from? Why did you choose that name? When we started Dream Alive Foundation in August 2017 our main objectives were to take underprivileged children on their first flight and inspire a generation of youngsters to reach greater heights. Our primary focus is to enable diversity within the aviation profession. We begin at grassroots level. Our motivation was further driven by the fact that statistics have demonstrated only 30% of South African pilots are black. But those pilots tend to have much privilege to get them there. We work to make aviation a realistic target to the most vulnerable children with the opportunity to experience flying, exposing them to the possibility of developing a passion for flying which will ultimately provide them with the will to pursue flying as a future career. Since inception we have had 37 children taken up both by fixed wing aircrafts and helicopters thanks to companies who have supported us which include Madiba Bay School of Flight and Helicopter Pilot Training Center. I chose the name Dream Alive Foundation because sometimes life is about risking everything for a dream no one else can see but you. Do you work with other pilots? What challenges/ triumphs did you face while founding it? We are running a health awareness campaign through which we provide young girls in underprivileged communities with sanitary wear because menstruation is not a choice. Some of the girls who have benefited from the menstruation project. Photo Courtesy. We have had less resistance in South Africa where the only challenge was mainly getting pilots to come on-board and work with us and our vision. Since receiving strong support from the main shareholder of Madiba Bay Flight School, Mr Gerhard Van Eeden, things got better. 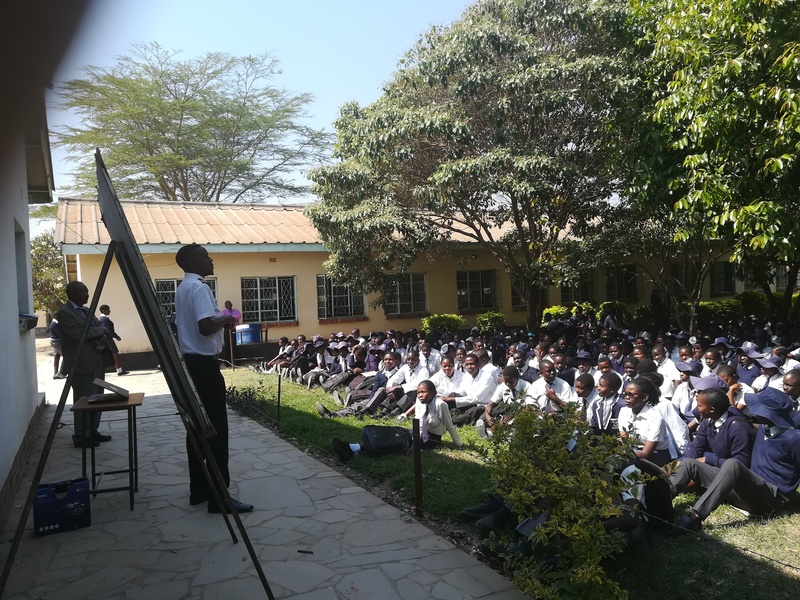 He supported the Foundation by allowing us to use his school for any activities we were undertaking and has allowed us to engage with all pilots at the school in relation to our projects. Our biggest achievement thus far was when Mark Rochat, chief Flight Instructor at Helicopter Pilot Training Center decided to help and contacted us about taking up a number of children at once. The helicopter company facilitated for 20 underprivileged children to be taken up on flights and provided them with eats after the flights. Do the children you are working with all come from a particular area? What are their ages? How do you identify those that take part? The children we work with come from the poorest parts of society in the two countries in which we operate. In South Africa,most are from Walmer Township in Port Elizabeth. Walmer Township remains one of the poorest neighborhoods in the Eastern Cape. Prevalent issues in the township include unemployment, HIV/AIDS, alcohol abuse, child neglect, crime, and illiteracy. The home of about 70,000 residents, Walmer lacks sufficient resources to remedy these ailments as there are only two primary schools, one high school, and one clinic in the township. This lack of resources ultimately creates enormously difficult obstacles for the township’s youth to defeat the cycle of poverty. The age group we target is 10 - 18 years old. This is because we prefer to work with children who have reached an age in which they understand the importance of education and that their future is not determined by their circumstances. In this regard, we have partnered with One Life South Africa, a non-profit organisation that takes care of children in these areas. When we organise flights for a given child from a logistical perspective (securing the pilot’s time and aircraft), they profile and facilitate the child for us to ensure maximum benefit and route through which to follow up on the experience. Excited: Some of the children Tatenda works with. Photo Courtesy. We began our Zimbabwean operations in February 2018 and we have been working with children from one of largest Harare’s Budiriro township with two clinics and five elementary schools. In 2008, the suburb had the highest number of cholera outbreaks accounting for 50% of the reported cases in Zimbabwe. Another disease, which is common in Budiriro, is typhoid which, is transmitted through poor quality drinking water. What do you hope to change with the foundation? Taking up underprivileged children with a dream to be a pilot on short flights to expose them to the benefits of aviation and kick start an interest in aviation as a career path. As a qualified commercial pilot I have spent most of my time engaging with young vulnerable children about career opportunities and have discovered that it is not uncommon for them to have an interest or passion in aviation. However, the resources are not always there for these interests to manifest into targets. This is why, in South Africa,one of the requirements we ask the pilots is to do the pre-flight with the children, explaining the importance of each activity they do and why they do it during their pre-flight. For the children who do not wish to pursue aviation, we still aim to activate the child’s own natural desire to want to learn. Our long term vision would be for the aviation industry to employ these children in our society at all levels within the industry changing the cycle of having careers that are out of reach for certain individuals who come from a poorer background than others. Our platform creates social and economic benefits when students are supported to make effective transitions from secondary school to further education training and employment. We want to play an important role in helping vulnerable children engage with curricula that supports student's interest, strengths and aspirations. Career guidance in aviation is uncommon in both Zimbabwe and South Africa when compared with more traditional support offered for conventional careers such as Accounting, Engineering, Law and Medicine.Our aim is to be the guides that are currently not there, which we want to bring about the result of making aviation an accessible career. 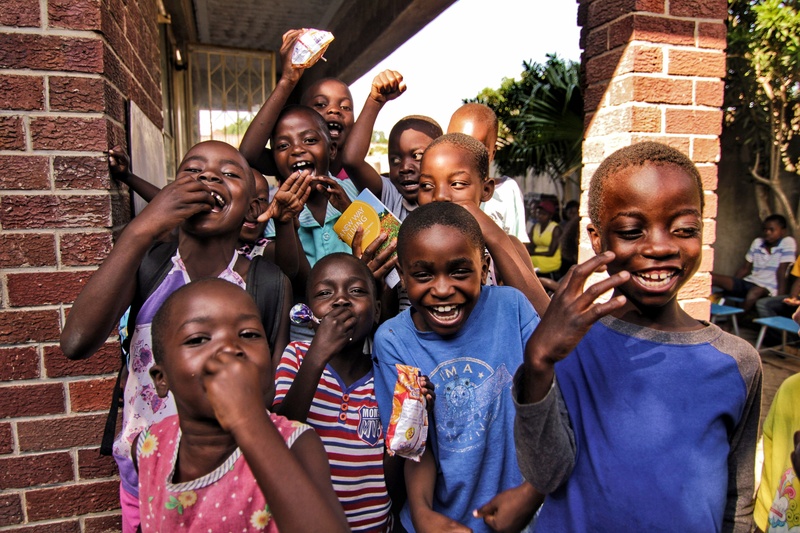 In Zimbabwe, our focus has been on running a health awareness campaign through which we provide young girls in underprivileged communities with sanitary wear- As mentioned above 44% of rural shops in the region do not sell sanitary pads. As a result, and due to constrained incomes in rural communities across Southern Africa, school-going girls miss an average of one week of school every month - leading to higher dropout rates, early pregnancies and increased risk of disease. In our experience in Budiriro, one of the largest townships in Harare, Zimbabwe - we have found young girls using banana leaves, feathers and even cow dung in place of sanitary pads. 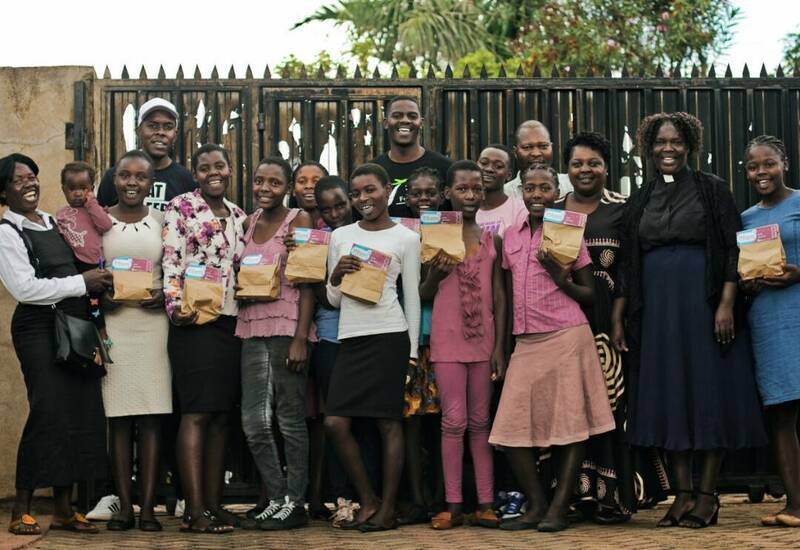 To date we have supplied 40 re-usable pads to 18 girls (roughly two pads per girl) in that community, and our target by year end is to supply 500 girls with 2 pads each to ensure that they get through at least 1 full school year uninterrupted. Long term, we aim to reducecarbon emissions in African aviation. Research has demonstrated thatthe aviation industry alone is responsible for approximately 3% of the world’s man-made carbon emissions. With growing demand from an increasing number of airlines and flights catering to the growing African middle class and its travel needs, this contribution to emissions is set to increase by 5%. At the same time, Africa is among the most vulnerable regions to climate change due to significant populations across the continent being dependent on primary industries and subsistence agriculture for survival. As Dream Alive Foundation we acknowledge that as pure as our intentions may be in taking up children on educative flights, we are also affecting the climate with Carbon emissions released by a given aircraft. Our response is that for every child taken up on a flight a tree will be planted to counter the effects of our activities.So far we have planted 110 trees in Domboshawa, Zimbabwe and we will continue as we grow in scale. In this regard, we have chosen a particular tree – the Croton Megalobrys - more commonly known as the Fever Berry tree. This tree absorbs Carbon dioxide, can be used to treat Malaria, can be used to create feed for live stock and has the capacity to produce bio-fuel. We have shared this knowledge with the community in Domboshawa to educate on the effects of global warming but also to assist the community on a more basic level with a natural resource that can aid in daily needs. What has the response been so far? How else do you plan to create awareness for it and ensure it gets to the intended audience? The response from multiple stakeholders has been overwhelming and continuous. To begin with my parents’ dedication of financial resources to me despite the challenging economy in Zimbabwe has enabled me to get these early projects off the ground.I have also received strong support from donors who have enabled us to provide food aid and sanitary wear in Zimbabwe as outlined above. We plan to create awareness by reaching out to more partners who can capacitate and facilitate our ability to execute our projects. We also run social media presences on Facebook, Instagram and Twitter to circulate our messaging consistently across geographies. This has enabled us to secure donations from Canada to support our work in Zimbabwe. On the ground, we continue to visiting underprivileged communities to talk to them about the Foundation, the work it does and, of course, aviation. How many children are involved in the programme currently, how does it work, is it that you want them to experience flying or does the exposure lead to more? Any success stories of change. 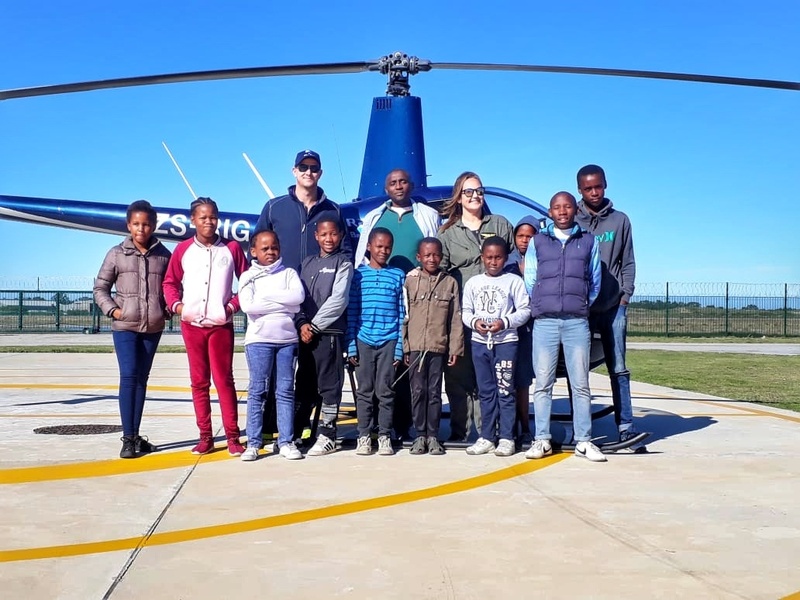 Thus far, in South Africa we have engaged 35 children through our educational flights with the permission of Madiba Bay School Of Flight and Helicopter Pilot Training Center in Port Elizabeth, South Africa. We have also provided 80 children in the Walmer township community with food assistance. In Zimbabwe we have only managed to show 2 children a plane and educated them courtesy of Central Air Transport Services. We have engaged with 58 children through our aviation education and sanitary assistance projects. However, we have also engaged other children indirectly (through food assistance) bringing our total of direct and indirect engagements in Zimbabwe and South Africa to 175. If you had a chance for a ‘do over in life what would you do different? I would have worked harder in life. Built a work ethic needed in life not to just be good but the best. Another is I would have started investing my time and effort in helping the community and the less fortunate earlier in life and in my training towards my Commercial license. What would you ask of other professionals who you feel can make a difference in their own communities? I would say to them to remember that when you make it don’t forget to reach back and pull someone else up who was in the same circumstances as you. As individuals, we have a problem that we measure our success not by the other successes we create but by how many failures we see around us. But until we create a mindset to go back to build those who need to be built, we won’t create a better generation, a better Africa. After all it’s said that leaders become great not because of their power but because of their ability to empower others. What are your goals you’re yourself over the next 3-5 years? I am currently unemployed so definitely one of my targets is to kick start and build my career. I wish to one day work for an airline that also has a strong CSR program that I can work with and supports the foundation. In terms of the Foundation I want it to grow and be self funded as currently the foundation is operational due to the financial help of me, family and friends. Who and what inspires you? Do you have a life Mantra? Firstly it’s my brother. He’s my role model and what he has achieved for himself and the family really inspires to aim high and do well. Secondly Nelson Mandela inspires me because despite the difficulties he faced, he came out of that and became a greater man. He put the people’s needs before his and that truly takes a lot for someone to be able to do that. The way he believed that education was important, the way he thought children should be educated as they are our next generation inspires me. My favorite quote of his is “Education is the most powerful weapon which you can use to change the world”. My life Mantra is “The journey of a 1000 miles begins with the very first step” You can’t just get to your destination, you need to take steps and every step you take is progress no matter how big or small. A little bit of progress is progress and it teaches against procrastination. To undertake any venture, no matter how large, you have to make a start. After all building of a skyscraper started off with one brick.